This Moroccan Lentil Soup with turmeric and lamb is comfort in a bowl. And while it’s categorized as a soup, it’s a full meal on its own. If using an Instant Pot, this meal is ready in 30 minutes! Today’s pure deliciousness in a bowl recipe is in partnership with American Lamb— All thoughts and opinions are my own. I know it’s Spring, but guess what? It still feels like soup for dinner! 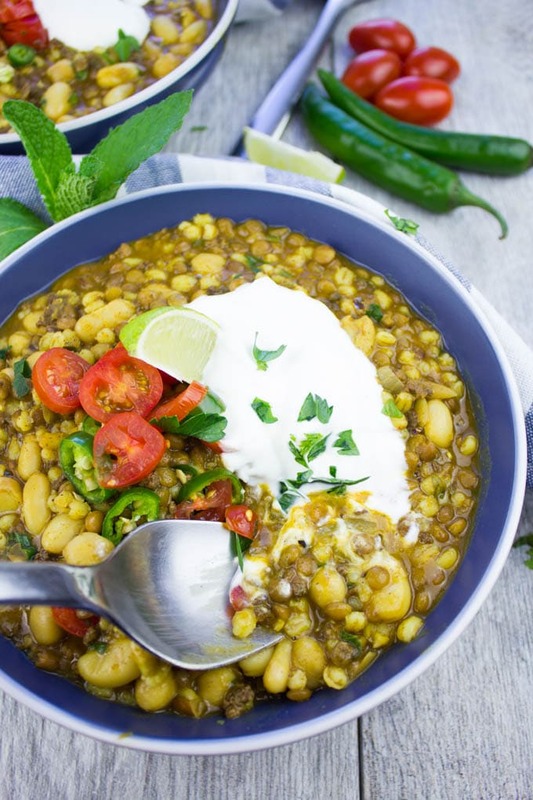 This Moroccan Lentil Soup with turmeric and lamb is just what I need. It’s such a joy to share how much I LOVE lamb with you, and especially American lamb because it’s by far the highest quality lamb I’ve ever tasted! For some of you who haven’t tried lamb, or have a bad experience with lamb, I can certainly say it’s because you didn’t try American lamb! What goes into Moroccan Lamb and Lentil Soup? I came across this wonder of a soup through a Moroccan chef who worked for us a long time ago. It was love at first sip. Literally. I was very keen on her showing me exactly how it’s done and have been making it ever since. About a decade later, I’ve met a lovely Moroccan friend through a kids activity. And the first thing I probably told her was that I LOVE Moroccan lentil soup!! So she invited me over and made it for me. I found out that every Moroccan grandma makes this lentil soup a bit differently. The base of it always includes lamb, lentils, and chickpeas. Sometimes it could include tiny pasta shells added at the end, and veggies like carrots, sweet potatoes, peas, etc. Also, the ratio of lamb versus lentils may vary from one home to the other. So as a result, I’ve tweaked my soup recipe a bit to include extra cilantro, more turmeric (which I’ve been loving lately!) and added some white beans and barley. I couldn’t ask for more. This easy comforting soup is insanely delicious! 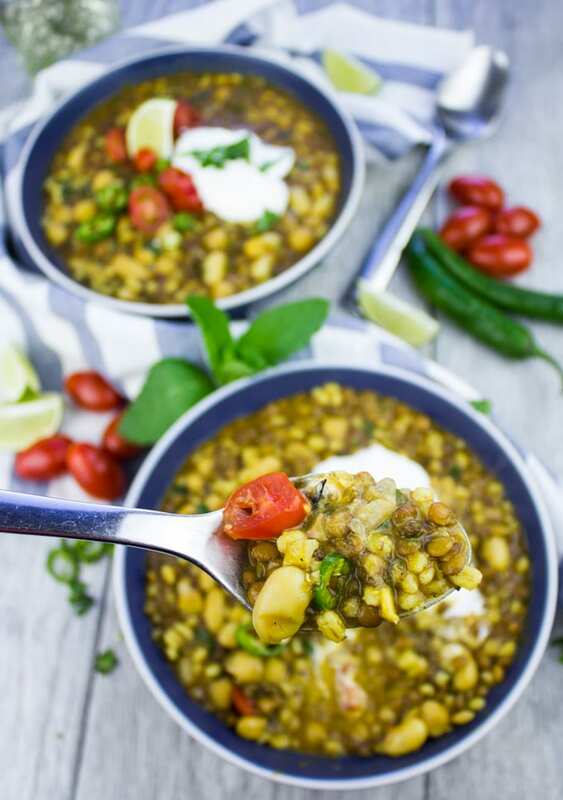 Let me tell you, this Moroccan lentil soup is the bomb! 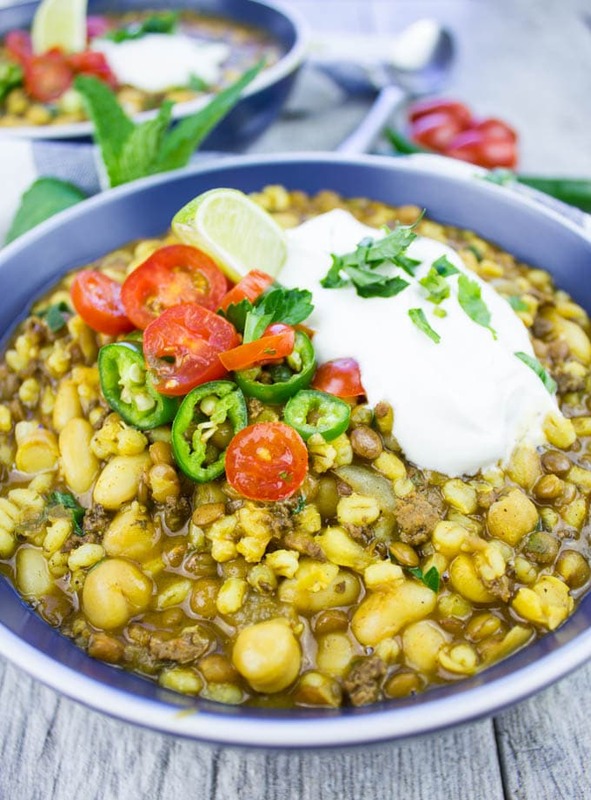 Flavor and protein-packed fresh lamb, more goodness from black lentils, chickpeas, barley, and white beans all cooked in a fragrant turmeric tomato base. Bonus-this delicious lamb and lentil soup recipe can come together in just 30 minutes if you’ve got a pressure cooker or instant pot! It’s one of those soups that has really all you need in a full meal. Before I go into details of this lick your bowl delicious lamb and lentil soup, I should mention a few things. This recipe is so easy, I’ve made a quick video below so you can watch how it all comes together. Another thing, I probably should mention that you don’t need to have cold weather to enjoy a bowl of soup like this. I used to make Moroccan lentil soup all year round when I lived in Miami. And almost every time this topic comes up, the same thought pops in my mind. Why on earth did I leave Miami?! I don’t have a real answer, just some excuses which are even more confusing! 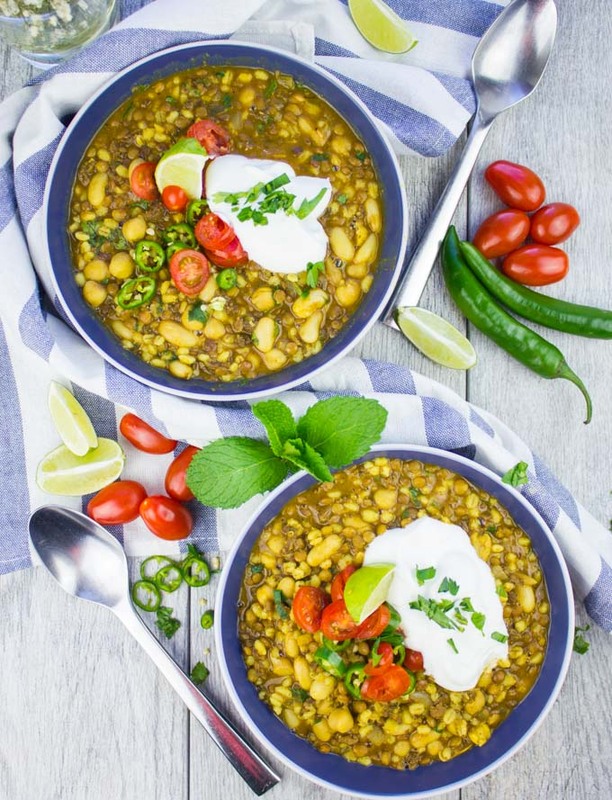 So if you’re having some cold weather and need a warm cozy bowl of comfort and deliciousness, make this Moroccan lentil soup. Here’s a breakdown of how to make this Moroccan lentil soup. If you have an instant pot (like I’ve used in the video) or pressure cooker, it’ll all be ready in 30 minutes. If not, then it works just as well on your stove, but it needs around an hour. So start by sautéing the onions and garlic, add your American lamb and start seasoning. Salt, pepper, nutmeg, turmeric, paprika and cumin. Then, throw in a slice of lime, cilantro, tomato paste, lentils, barley and the liquid of your choice. I added stock and water combo for an extra boost of flavor. However, I’ve made it a few times with water alone and it was still delicious!! Since I used an instant pot, I set it to pressure cooker and it took just 30 minutes for the lentils and barley to cook through. Then I added my canned and rinsed beans, chickpeas and a little more water. At that point everything is cooked, so you basically need to just give the lentil soup 10 mins of simmering so all the flavors infuse beautifully together. There you go. Soothing, comforting, hearty, filling and mouthwatering delicious lamb and lentil soup that’s ready in 30 mins. Finish your Moroccan lentil soup off with some spice, fresh tomatoes and cooling Greek yogurt for a contrast of taste and textures. Something as tiny as those garnishes can make your lentil soup feel like a fancy meal 🙂 Try this delicious lamb and lentil soup and tag me to check out your scrumptious versions of lamb lentil soup! Get more lamb recipes here and enjoy more lamb in life. The beauty of this soup recipe is that anything would be great to add here. Something like fresh kale, spinach, carrots, or sweet potatoes. Just add them halfway after you add the lentils because the lentils need to cook the longest. I love finishing off my lamb lentil soup with some cooling Greek yogurt, chopped chilies, cilantro, and tomatoes. 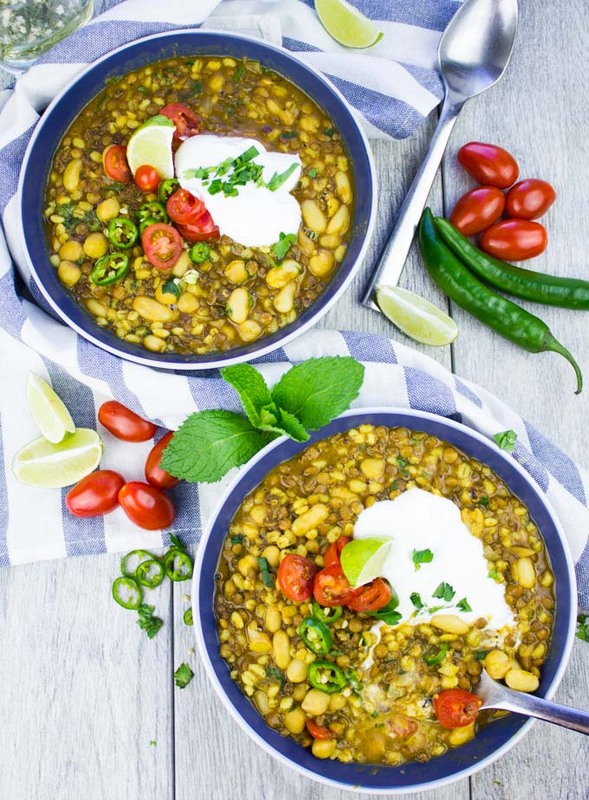 This is certainly optional, but it really does give your lentil soup a nice contrast in texture and freshness. As a liquid, I like to add a mix of broth and water to give the lentil soup extra flavor! This Moroccan Lamb and Turmeric Lentil soup is comfort in a bowl. And while it’s categorized as a soup, it’s a full meal on its own. Protein-packed fresh lamb, more goodness from black lentils, chickpeas and white beans all cooked in a fragrant turmeric tomato base. Bonus-this delicious lamb and lentil soup recipe can come together in just 30 minutes if you’ve got a pressure cooker or instant pot! 4 cups liquid a mixture of broth/stock (any flavor you prefer) and water. Preheat your instant pot, or regular pot on medium-high heat. Add the olive oil and sauté the onions for 2 minutes until they start to soften, then add the garlic and lamb. Start seasoning the lamb and add the salt, pepper, nutmeg, turmeric, paprika, and cumin. Sautee the lamb for 5 minutes until cooked. Add in a slice of lime, cilantro and tomato paste and mix them in with the lamb mixture. Then add in the lentils, barley and liquids. Cover your pot and allow the lentils and barley to cook through. If using an instant pot, set it to pressure cooking and set it to 25 minutes, and if you’re using a pressure cooker, also set it to 20-30 mins most. If you’re making the soup on the stove, then allow the mixture to boil, lower the heat to medium-low, cover the pot and allow the soup to cook for 40-50 minutes until the lentils cook through. Add the beans and chickpeas, plus an extra half cup of water if needed** and cover the pot for another 10 mins. At that point, add some cilantro and serve! Hi. Nice recipe. Question: lentils, barley, chickpeas and white beans. Do you use dried stuff? It’s not clear to me. Thank you. Hi Claudia, Yes there’s the lentils and barley which are raw so they need the most to cook. The beans and chickpeas are canned, drained and rinsed, that’s why I added them towards the end. Feel free to use all raw beans and chickpeas too, but add them at the beginning with the lentils and adjust the cooking time/water amount. what great flavors to enhance lamb. We eat alot of lamb and never had it like this I will have to try this soup . A great idea! I love soup/stews that are meals all on their own. One bowl, done!! I love lamb and moroccan flavors. This looks delish! that’s exactly my feeling Kylee! I’m so glad to find this lentil recipe. I’ve been trying to add lentils into my menu rotation more often and need a variety of ways to serve them, since my husband isn’t as big a fan as I am. you never know Noel, maybe this soup might change his mind.. Thanks Michelle! It really is all of that. This is a 100% perfect soup for me. I want to thank you for this great recipe! Looks very tasty. I definitely want to try it. An interesting mix of ingredients. Thank you! M fiance always says that soup isn’t real food lol…but he LOVES lamb and I can you with certainty that when I make this for him, he will eat it ALL! Love the flavors! Love the taste of lamb! And what a great combination of spices in one soup. This is one soup that I know our family will enjoy! I’ll be making this soup this coming week. It’s really the perfect combo and American lamb adds so much more flavor!! I can almost smell the flavors you have in this soup. I love lentils and I love lamb, Moroccan flavors are always in our home so this is do-able sometime soon. It’s really worth trying it Veena! I know without a doubt I would love this! This looks absolutely delicious and such a comforting bowl of soup to end the day with. I have to give this a try! I think it’s really worth trying and you’ll be hooked! 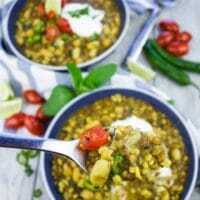 Lamb and lentil soup looks hearty and filling love the addition of turmeric and spics. For me I can’t imagine a curry without turmeric. I know what you mean Swathi!! This combo is magic.